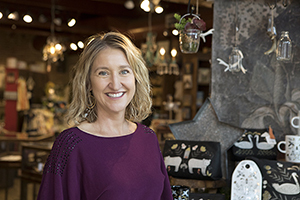 After years of traveling and a career in art and design, Amy Wildgrube, found a new home in Bliss —an inspiring atmosphere that features the creations of many fabulous artisans and the freshest styles from designers. First stop… Bliss, of course! We love to show off the beautiful work of our local artisans that we carry ~ jewelry, art, cards, home decor, hand-poured candles… even hand-hammered copper Moscow mule mugs. Everyone wants to pack a slice of Boulder into their suitcase and take it home. Boulder Arts & Crafts Gallery has been a hit for all our out-of-towners. The handmade treasures inspire our guests, just like our beautiful sunshine and Flatirons. For clothes, we love wandering Barbara & Company, Nani Nalu and Island Farm. If the kiddos are in tow, we usually detour to Into the Wind, Liberty Puzzles and the Boulder Book Store. When the weather is nice and we can be outdoors, we enjoy a glass of wine on the patio at the St Julien. A great view of the Flatirons to melt into! Another spot we love to share with our guests is Riffs Urban Fare. They have unique and tasty cocktails, plus fun names to boot. Our top spot to take guests is the Dushanbe Tea House, both the food and ambiance are curiously artistic. We also really enjoy Mateo for dinner or, for that matter, also lunch. If we have the kiddos with us, easy-peasy, we pop over to Pizza Locale, the adults and kids are all equally happy. Something for everyone, casual, yet refined. Breakfast.. well Snooze of course! Late night we, let the kids loose to shake about at Band on the Bricks. Enjoy a yummy coin or two at Tahona Tequila Bistro. Catch a concert, comedy act or film at the historic Boulder Theater. For more than 25 years, Barbara & Company has been helping women look their best, and not like anyone else. This Pearl Street boutique takes the dread out of swimsuit shopping with a skilled staff that won’t let you out of the cabana style fitting rooms in an ill-fitting suit. Find a wide range of styles and sizes (A to G cup / sizes 0-18), plus cover-ups, resort wear, beach totes, sun hats, and more. Liberty Puzzles are classic wooden jigsaw puzzles, made with quarter-inch maple plywood and the finest archival paper and inks. No two pieces in any puzzle are alike, and each puzzle features dozens of intricate, charming whimsy pieces. A Boulder food bar featuring conservatively priced, liberal appetizer portions of chef John Platt's artfully prepared diverse cuisine and carefully chosen beverages. A beautiful neighborhood restaurant serving Provencal inspired cuisine, supporting local farmers, ranchers, and foragers. Snooze re-energizes the way you think, feel, and ultimately eat breakfast. Established in 2006 by hospitality journeyman turned entrepreneur Jon Schlegel, Snooze invites you to a breakfast experience. Inspired by the sights and flavors of Mexico's Yucatan peninsula, Tahona Tequila Bistro offers an exciting mix of Mexican inspired cuisine, fresh squeezed lime margaritas, and a renowned tequila & specialty drink list, all served in a comfortable, colorful, energetic setting.